Pinclass is a new theme created and inspired from the successful sites like Pinterest. Go to Appearance on left hand menu. Search for Pinclass and click on Activate. Change the color scheme and style of the theme: Choose among OC, Red, Blue, Amber, Orange and Teal. Select your own color: Select your own color to overwrite the color of the prefined color scheme. Hover color of custom color: Select your own hover color. Boxed or wide layout: Choose between Boxed and Wide. Hide the header and footer on single ad and user profile page: Removes the header, breadcrumbs and footer of a single ad and user profile page. Enable to show the user your profile page as “your store”. 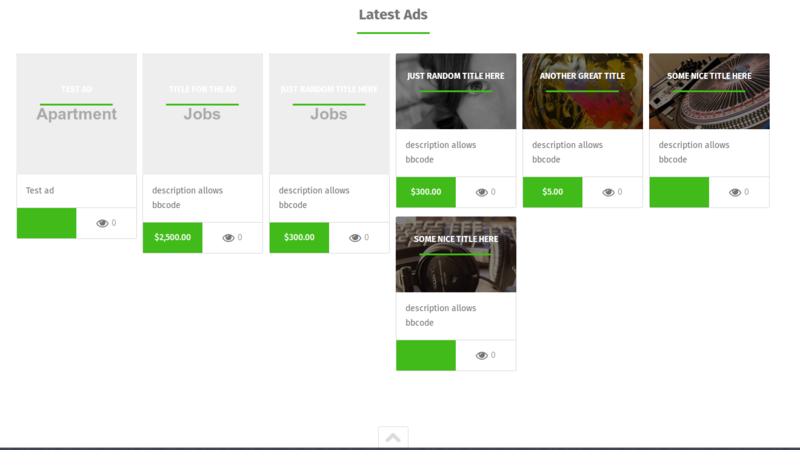 Numbers of ads to display in home grid: Select how many ads will be displayed on the homepage. Display flickerplate slider on homepage: Choose “Yes” to display the slider on homepage and then add the images and the titles of the slides. The h1 title of the first slide: The big title of the first slide. The h3 title of the first slide: The subtitle of the first slide. 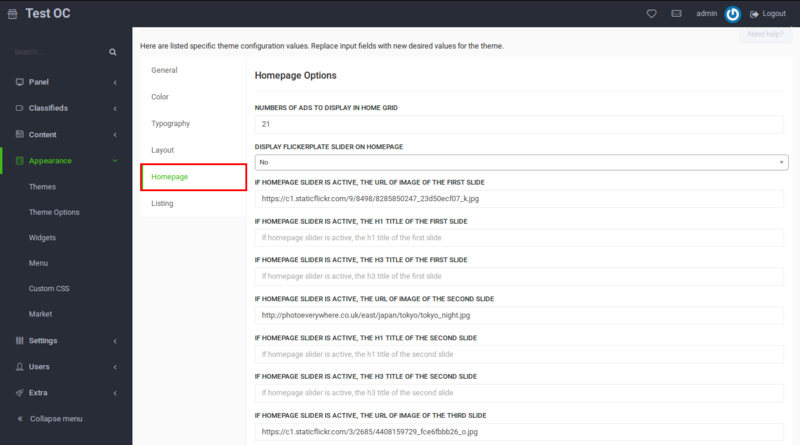 Show categories on homepage: If you enable this, categories will be displayed on the homepage. Homepage Only Header, allows HTML: You can put any text or banner as a header of your site. Works great for putting ads e.g. Adsense. Just paste the correct HTML of the banner. Select light or dark listings: Changes the style of your website. Yo can choose between Light and Dark. 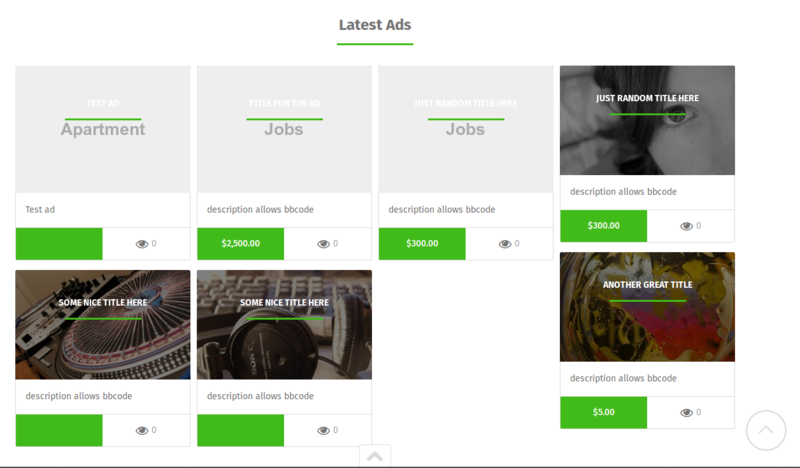 Select the listing style: Choose the style of the ads on the homepage and listing page. Select to display the Title in Ad, Title above Ad or Title below Ad. Make entire list item clickable on homepage: If you enable this, the entire item of a list on homepage will be clickable. For every listing it shows the price in the bottom extra info. Next to the price you can select a second option to show. : Choose which detail will appear next to the price in the bottom of the listing, between Number of Views, Location of Ad and Owner of Ad. Display slider in listing: If you want to have a slider in the listing page, choose between Default, Featured and Featured Random. Otherwse you can choose None. Hide icon on category/location description: If No is selected, category/location icon will be displayed on category/location page.